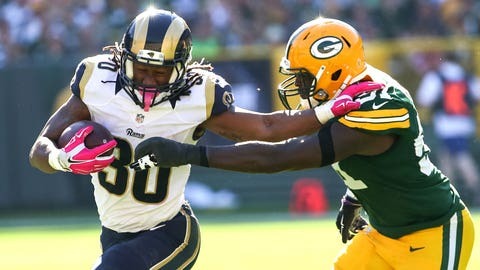 Todd Gurley is making good use of the stiff arm three games into his career. Size, speed, power. Those were the obvious attributes that led the St. Louis Rams to draft rookie Todd Gurley with the 10th overall pick. If that's not enough of a skill set for defenders to deal with, Gurley is flashing another part of his repertoire three games into his NFL career – a stiff arm that he referred to as his “signature move” early in training camp. Gurley is coming off a pair of huge games in his first two NFL starts, rushing for 305 yards on 49 carries to lead the league in both categories during that span. He said the success of a stiff arm is predicated on knowing when to properly utilize it.